Freezer Meal Asian Lettuce Chicken Wraps freezes beautifully, so double it up and freeze half for a quick weeknight meal! Chop veggies and chicken. Mix sauce ingredients together and set aside. Heat oil over medium-medium high heat in a large pan or wok. Add chopped veggies and sauté until they are tender-crisp, about 3-5 min. Add chopped chicken and peanuts (if using) and stir to combine. Pour half of sauce over chicken/veggie mixture and continue to cook until the mixture is heated thoroughly. 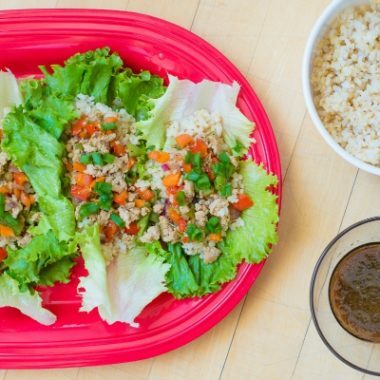 Serve immediately with rice in green leaf or romaine lettuce leaves. Garnish with extra green onions and serve with extra sauce on the side. If freezing, store the cooked chicken and veggie mixture after you've added the sauce in a gallon sized freezer bag. Defrost in fridge and reheat in skillet over medium heat until heated through. Serve over rice in lettuce leaves.